NASA Night Sky Network joined Ernie Wright on December 5 as he brought members the story behind the iconic Earthrise photo taken from Apollo 8, along with the behind the scenes story of how a brilliant visualization recreating this moment was created.The recording is posted below or can be watched on YouTube. The famous Apollo 8 photograph known as Earthrise, as well as two others taken at about the same time, document the moment on Christmas Eve, 1968, when the Earth was seen for the first time by human eyes over the horizon of another world. Until recently, space historians and the astronauts themselves disagreed about exactly how these photographs came about, including the identity of the photographer. Decades-old debates about Earthrise were finally settled by a visualization that used feature film computer graphics software, Apollo trajectory documents, and data from historical and current NASA spacecraft to accurately recreate the moment when the Earthrise photo was taken. A new encoding of the video at 4K resolution is planned for release this December to commemorate the 50th anniversary of Apollo 8. This talk will describe both technical and personal aspects of the making of the visualization and the questions that it answers. Ernie Wright has been using computer graphics to visualize scientific data for over 25 years. His early work included isosurface cloud visualization for the Defense Nuclear Agency Weapon Effects Directorate and terrain visualization for the Central Intelligence Agency Office of Imagery Analysis. He was also a LightWave 3D senior programmer, leading LightWave's third-party developer community as the host of its Internet mailing list and the author of the LightWave Server Development Kit. Since 2008, he has been a programmer and animator at NASA Goddard Space Flight Center's Scientific Visualization Studio, working primarily with the data from Lunar Reconnaissance Orbiter. He has a B.S. in computer and information science with a minor in communication from University of Maryland University College. He's a member of his local astronomy club and still owns the Apollo-era 60mm f/11.7 refractor that his father bought through the Sears catalog. We also have a related activity: Does the Moon Rotate? The answer may surprise you - and it may a help you visualize what the Earth would look like if you too were standing on the Moon. Ernie Wright and his team's video reconstruction of Earthrise from Apollo 8 is the featured image on Astronomy Picture of the Day for December 23, 2018. 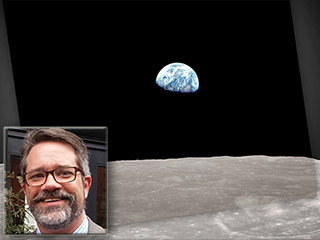 Also of note, the historic Earthrise image was actually the second image of the Earth rising above the lunar limb. The first was remastered in color from the original black and white, and appears on Astronomy Picture of the Day for December 24, 2018. While the Earthrise photo from Apollo 8 is the most iconic image of Earth from lunar orbit, it was not the first. That distinction goes to an image from Lunar Orbiter 1 taken on August 23, 1966. The Lunar Orbiter Image Recovery Project reprocessed the images, and made them more readily available. January, 2018 Smithsonian magazine article by Andy Chaikin. Related Activity: Does the Moon Rotate? NASA Night Sky Network joined Ernie Wright from NASA's Goddard Space Flight Center as he brought members the story behind the iconic Earthrise photo taken from Apollo 8, along with the behind the scenes story of how a brilliant visualization recreating this moment was created.